Recently we hosted our dear friends for bike week in Florida. We enjoyed many great meals together, both at home and at the great restaurants in New Smyrna Beach. I am never alone in the kitchen when we are together. There are many great cooks in our group. One day Barbara decided to spend some time preparing some of her favorite recipes. One was her homemade biscuits with country ham which I will blog about some time after we get back to NC. The other was her version of Mystery Bars. We passed a plate of them after our meal of Beef Bourguignon. They were an elegant ending to a great meal. Elegant you say? That was what struck me. A small morsel of rich tasting flavor hit me immediately. 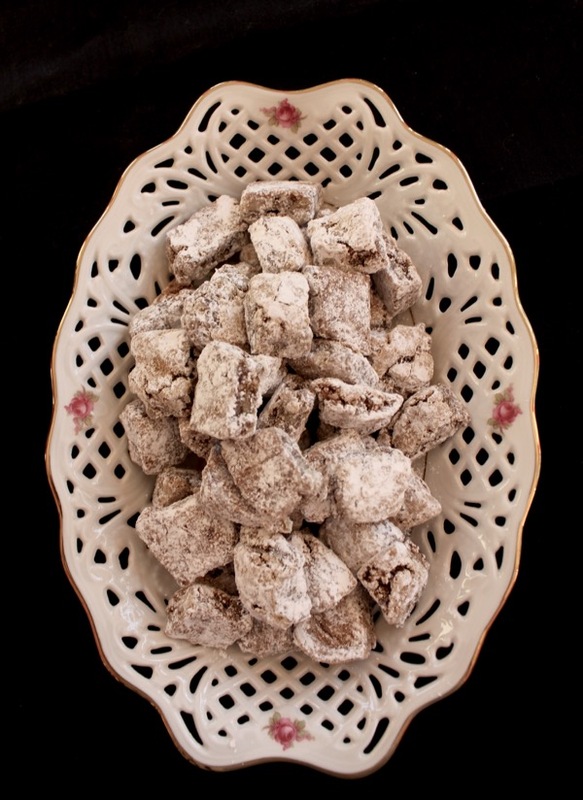 They are nothing more than lots of butter and dark brown sugar with what I consider the mystery; Black Walnuts. 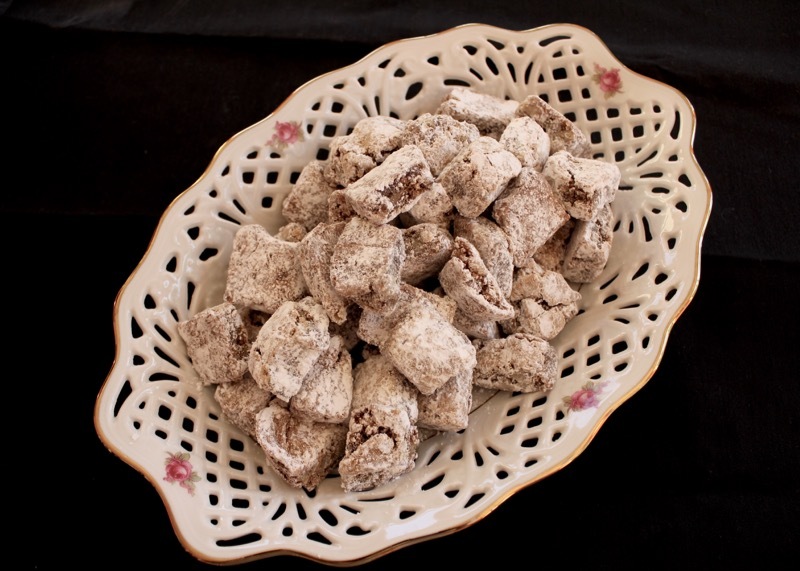 All of it is rolled about in confectioners sugar. Amazing. You will always have what you need on the pantry shelf for a quick and easy dessert. It was a wonderful week which also included one of the guys making two batches of boiled peanuts in a crock pot. I also made Barbara’s Chicken Poppy Seed casserole, which I blogged about here. Jackie brought a great smoked salmon dip and David made wonderful ribs and Big Charlie’s Gumbo. 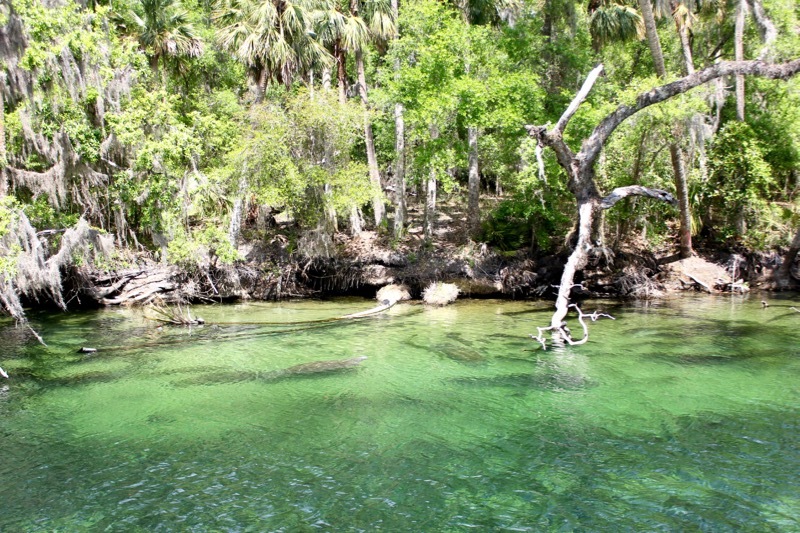 Last Sunday, after everyone had left, David and I went on an excursion to Blue Spring on the St. Johns River. During the winter months Blue Spring, with its constant temperature of 73 degrees, becomes home to hundreds of manatees. Manatees are marine mammals that live in the shallow rivers, bays and estuaries of coastal areas. They rarely venture into waters below 63 degrees. They are slow moving giants related to elephants, but totally aquatic; although they surface often to breathe. I had a one on one experience with a manatee a few years ago when we still owned our Florida home on a canal. One surfaced next to our dock when I was home alone. I had heard that manatees appreciate fresh water so I turned on the hose and sprayed it into the water. The manatee got under the spray and turned over onto her back and let me spray her stomach with water. She was playful and huge. I kept looking around hoping someone would come around to experience this amazing event with me. But it turned out to be a one-on-one moment. Alligators are afraid of manatees. Manatees are much too large to attack. Even so, mother manatees must protect their calves from alligators. If an alligator threatens a calf, several female manatees will coordinate protection by attempting to crush the alligator between their bodies. 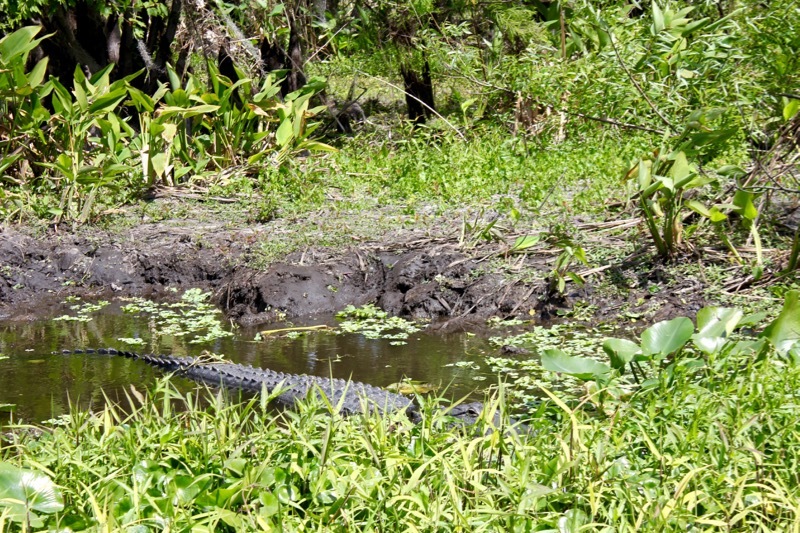 Our trip to Blue Spring brought us close to many species including manatees, alligators and great blue herons. We enjoyed a picnic on the grounds and came away appreciating nature on a beautiful spring day. We head home in a few days. I have a few mystery bars left to munch on in the car. I appreciate Barbara sharing this wonderful recipe. There are many Mystery Bar recipes on the internet, but I haven’t found one like this one. It is a keeper, an elegant keeper. Preheat oven to 300 degrees F. Beat eggs. Add brown sugar. Beat. Add flour, baking powder, salt and vanilla. Beat until smooth. Stir in nuts. Pour into 9×13 inch dish. Bake at 300 degrees F for 45 minutes. Cool completely (Very important). Cut into squares. 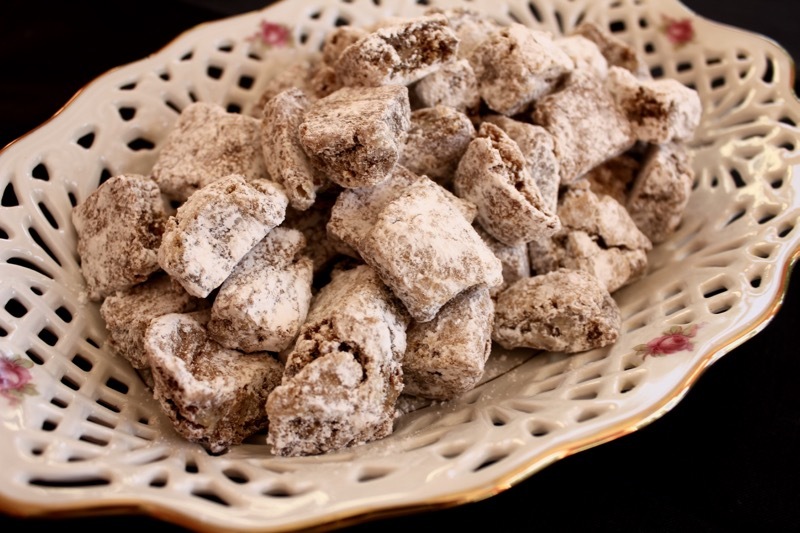 Roll in powdered sugar. Recipe does not turn out right with store brand dark brown sugar. Use name brand such as Domino. Posted on March 28, 2018 at 1:10 pm. As a former school librarian, there is nothing more fascinating that visiting a local library in the town where I happen to be at the moment. I recently got a visitor’s card to the New Smyrna Beach Library and have since checked out over 12 books. I am like a gourmand in a food emporium when visiting a library and this library delivered. All of the latest cookbooks where available. Both David Leibovitz’s books, My Paris Kitchen and L’Appart were on the shelves. I also found Ottolenghi; The Cookbook by Yotam Ottolenghi and Sami Tamimi. On a lighter note, I starting reading a culinary fiction series. Katherine Hall Page is the author of the Faith Fairchild books about a caterer with the business “Have Faith in your Kitchen” who is also married to a minister. She cooks up delicious food while solving mysteries and dealing with the challenges of being a minister’s wife. In the book, The Body in the Attic, Faith and her husband make a temporary move to Boston where he is an interim Divinity Professor at Harvard. I love the play on words of these Harvard Squares. This is basically a bar cookie and allows you to make 48 cookies in one batch. A great idea for a caterer or anyone not wanting to deal with batch after batch of cookies. I received a very special Valentine’s present this year. 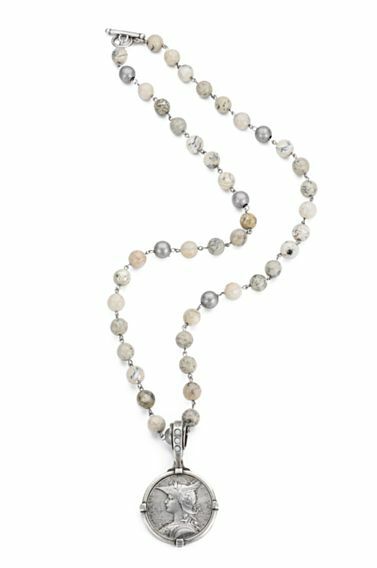 I have been admiring the French Kande line of jewelry for a long time. David gave me this necklace, although mine has a different Medallion. The designer, Kande, found French Medallions at a Paris Flea Market years ago and became inspired to create beautiful jewelry with them. 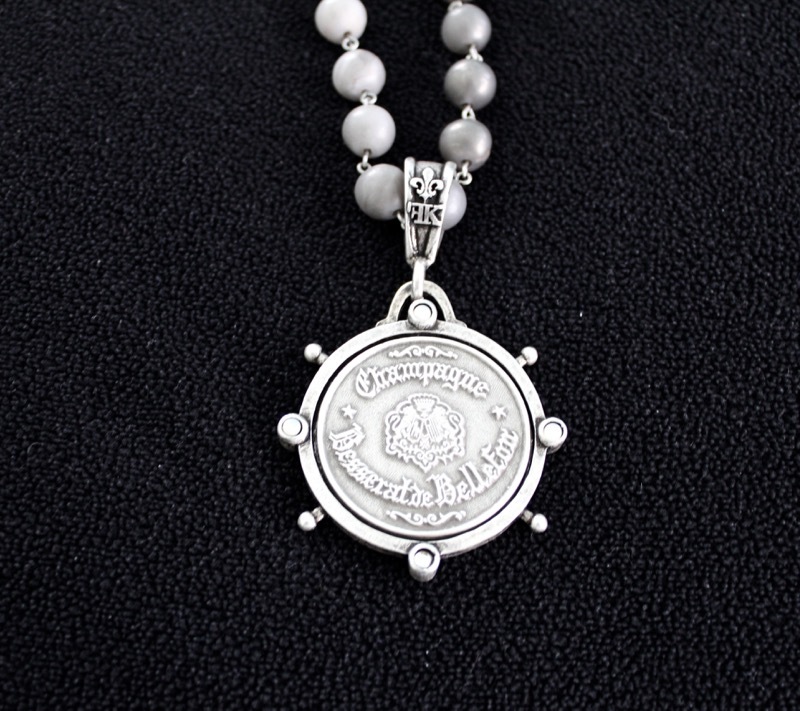 My medallion is a Silver Champagne medallion from the Champagne region of France. I love it. 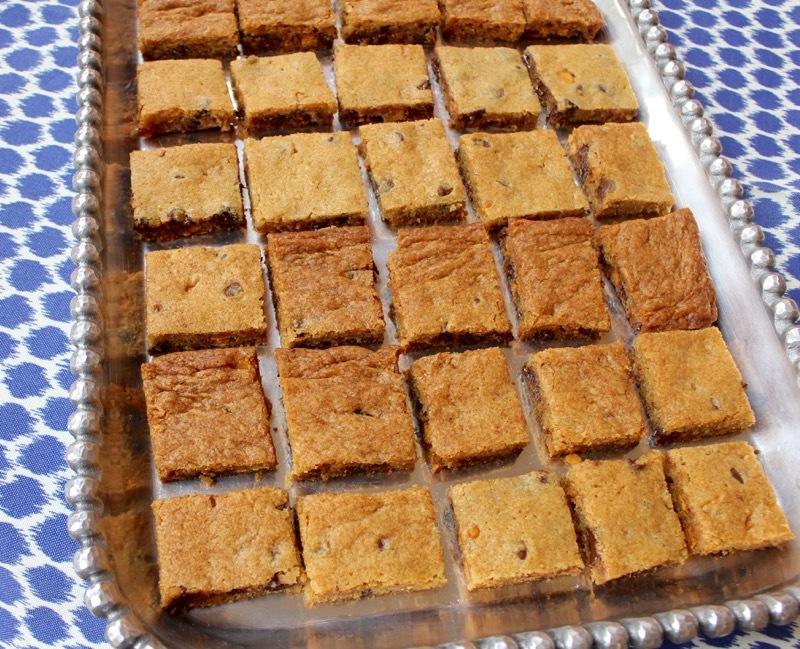 Give the Harvard Squares a try. I used a combination of chocolate chips and butterscotch chips. The next time I would cut down or eliminate the butterscotch chips. They overpowered the flavor profile. Preheat the oven to 350 degrees F. Cream the butter, then add the sugars and beat until fluffy. Add the eggs and vanilla, mixing well. Combine the flour, baking soda, and salt, then add to the batter. Combine the chocolate chips and other chips. Stir them into the batter. Spread the batter evenly into a well-greased jelly-roll pan (approximately 15 1/2 inches by 10 1/2 inches). Bake in the oven until golden brown, 25 to 30 minutes. Cool in the pan, then cut into squares. Makes 48 squares. Posted on February 20, 2018 at 1:16 pm. Cookie Brittle is a new treat for Christmas in our house. The recipe came from one of my favorite sites, Food52. I will be packaging this up for friends and neighbors. The butterscotch-caramel flavor of this crispy treat is habit forming so be careful when you make it. Someone in our house has been sneaking bits of it at all times of day and night. Think I am going to have to make a second batch. 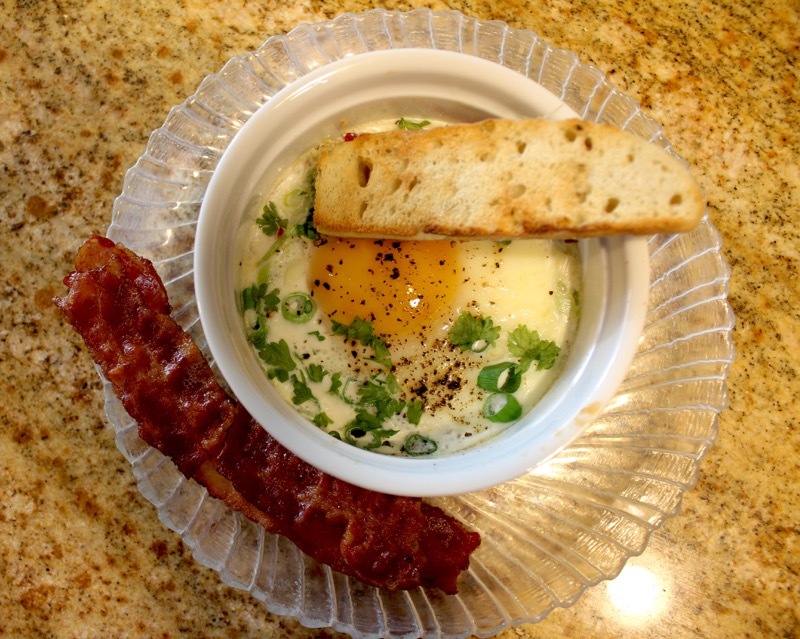 These shirred eggs make a wonderful festive breakfast for the holidays. They can be prepared ahead and then baked when you are ready. Make as many as you want. It was a perfect Sunday morning meal. Served with bacon and Focaccia Bread Stick for dipping you can’t go wrong. The recipe is here. 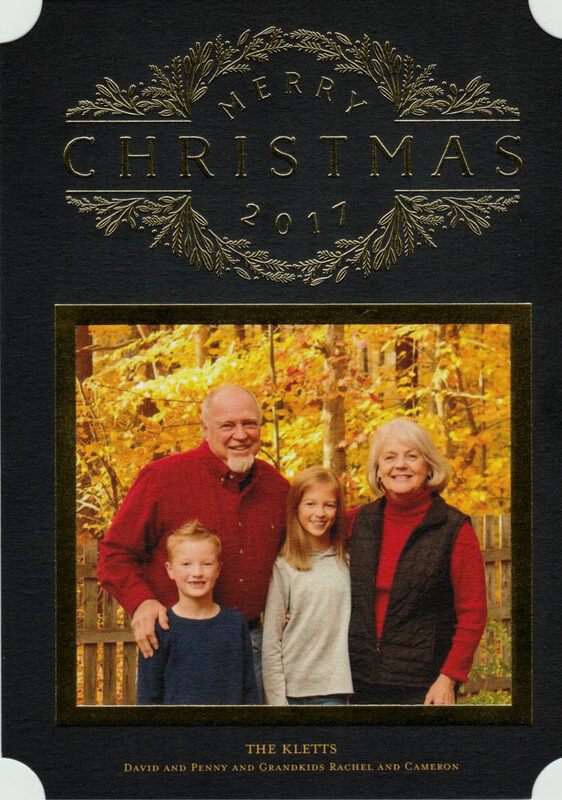 Our Christmas card this year. The Grands are growing up so fast. Wishing all of you a festive holiday and Happy New Year my friends. 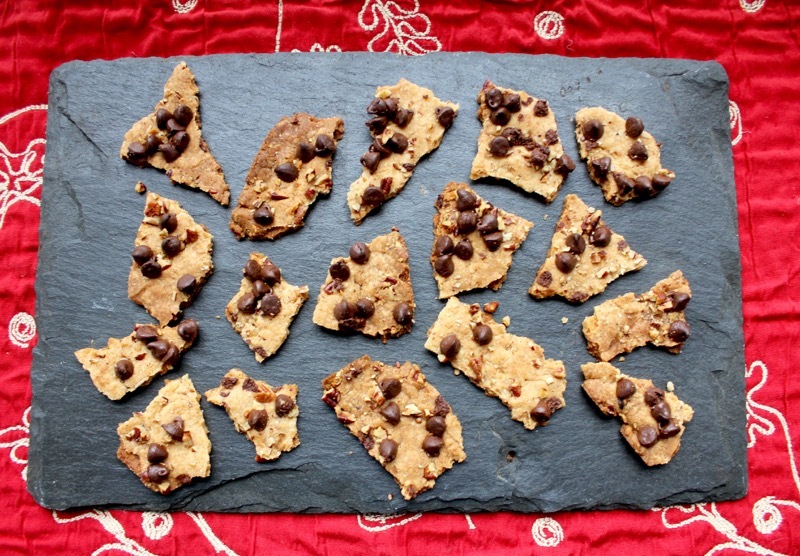 You can find the recipe for Chocolate Chip Cookie Brittle here. Posted on December 19, 2017 at 1:13 pm. I try very hard not to eat sweets. But there are a few sweets that I can’t resist. They all seem to have a hint of salt. Salted dark chocolate is a favorite. But while we were in Paris a few years ago, I fell in love with salted caramel macarons. The caramel was sweet and smooth. The salt added just the right counterpoint. I have been in love with that combination ever since. 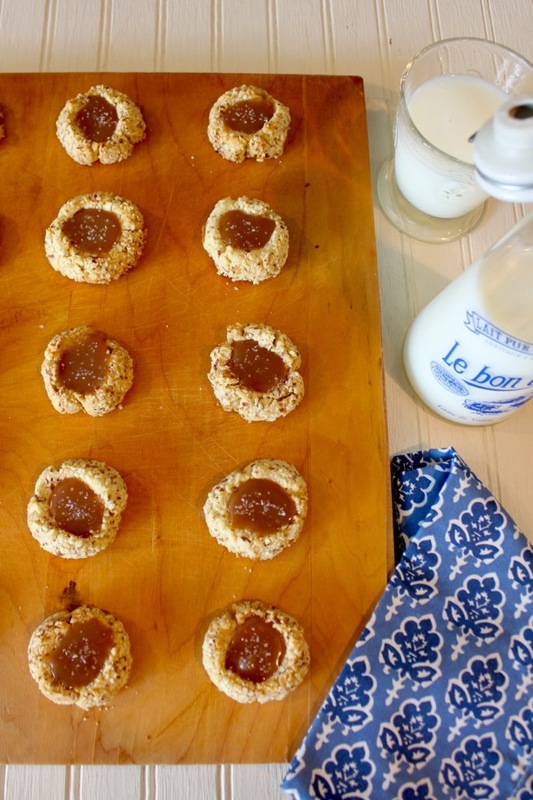 Because I have not mastered macarons yet, this recipe for Salted Caramel Almond Cookies fit into my “can do” repertoire. 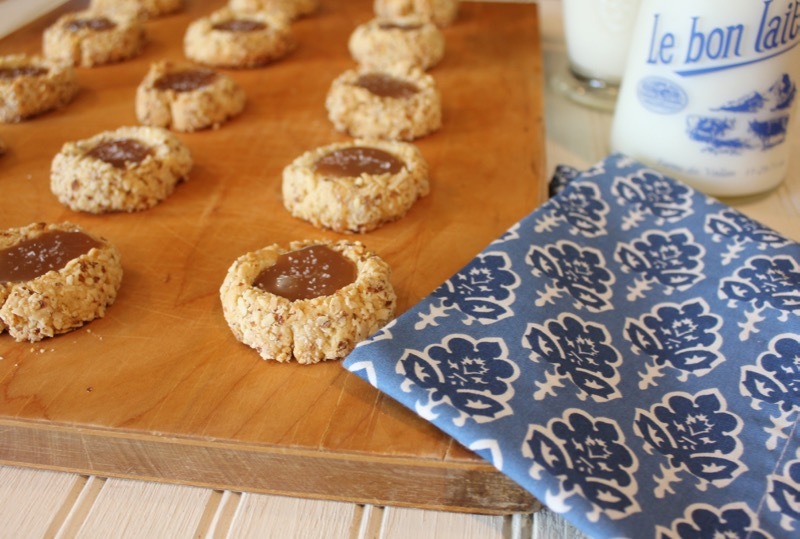 The cookies are buttery and nutty on the outside and richly caramel with a bit of salt at the center. It hits all of the right taste buds in your mouth. As an aside, the worn cutting board that the cookies are on was my Mother’s and my Grandmothers before her. They both used it to roll out their pie crusts. It is one of my treasured possessions. I love Spring at the lake. 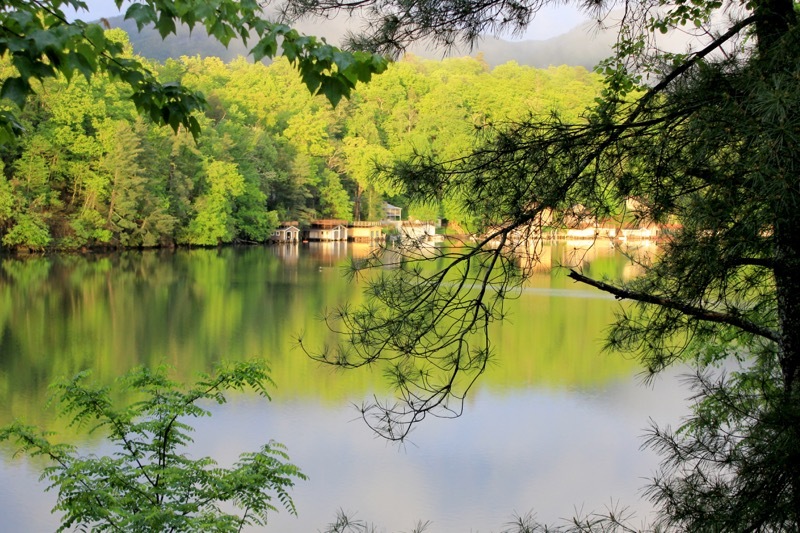 We have had lots of rain but a few mornings ago the sun came out and reflected the vibrant spring green of the trees onto the lake. It was magical. Preheat oven to 350 degrees F; line baking sheets with parchment paper. In the bowl of a stand mixer, beat butter and brown sugar at medium speed until creamy. Add egg yolks, on at a time, beating well after each addition. Beat in vanilla extract. In a medium bowl, stir together flour, nutmeg, and salt; gradually add to butter mixture, beating until combined. Roll mixture into 1 1/2 inch balls. In a small bowl, whisk egg whites until foamy. In a separate small bowl, place almonds. Dip cooke balls in egg whites, letting excess drip off; dredge in almonds to coat. Place 2 inches apart on prepared pans. Using a spoon, make an indentation in center of cookies. Bake for 10 minutes. carefully press indentations down again; bake until cookies are lightly browned, 3 to 5 minutes more. Let cool on pans for 2 minutes. Remove from pans and let cool completely on wire racks. 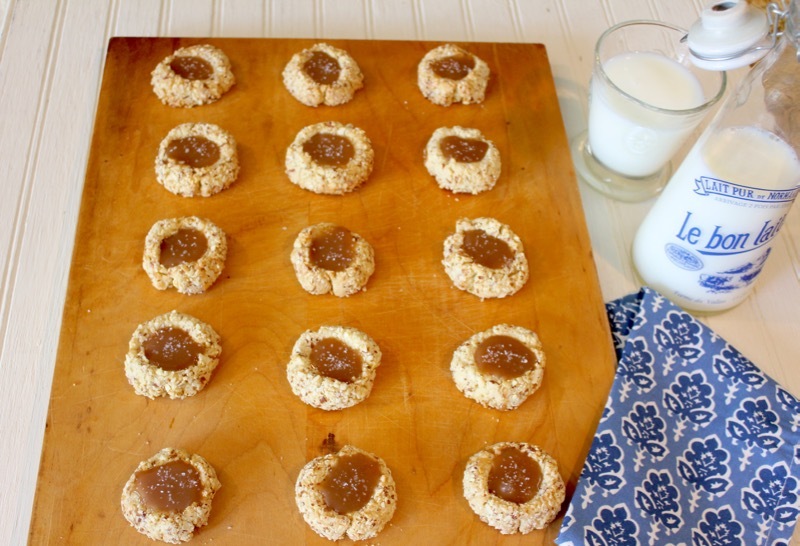 Spoon warm Caramel into indentations in cookies. Let stand at room temperature until caramel is cool. Sprinkle with kosher salt. Serve immediately, or store in airtight containers for up to 5 days. In a large skillet,whisk together sugar, 1/2 cup water, and corn syrup; bring to a boil over medium heat. Reduce heat, and simmer, stirring occasionally, until mixture is honey-colored, about 10 minutes. (Mine took longer). Add butter, whisking until melted. Remove from heat, and gradually whisk in cream until mixture is smooth. Pour into a heatproof container. Cover and refrigerate for up to 2 weeks. Posted on April 27, 2017 at 8:48 am. My cottage was supposed to be on a local Christmas Tour this year. Since it has a country French look to it, we decided to carry the theme throughout the house. 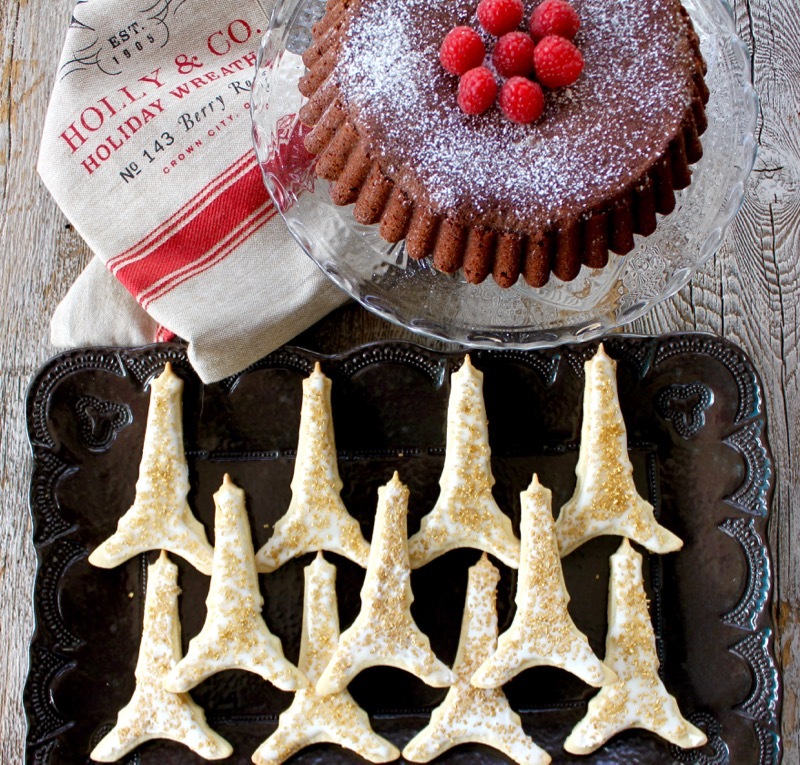 David downloaded some lovely Christmas carols sung in French and I made Eiffel Tower sugar cookies and a French Cake from Mimi Thorisson. Because of the fire on the mountain, the tour was cancelled . . . so, I ended up with a freezer full of cookies and this delicious cake. The sugar cookies are simple. Use your favorite sugar cookie recipe. I used this one from Alton Brown. You can use royal icing or any white icing that you prefer. 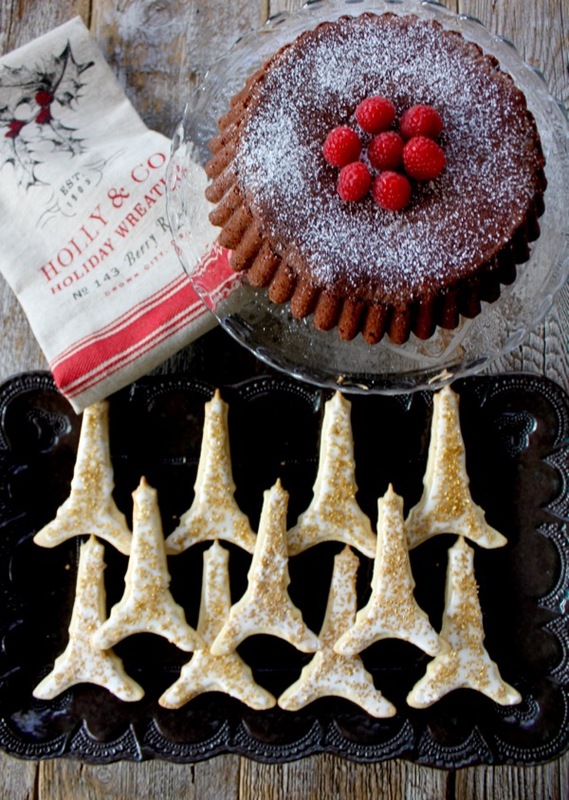 Sprinkle with gold sparkles and the Eiffel Towers will glow as if they were lit. 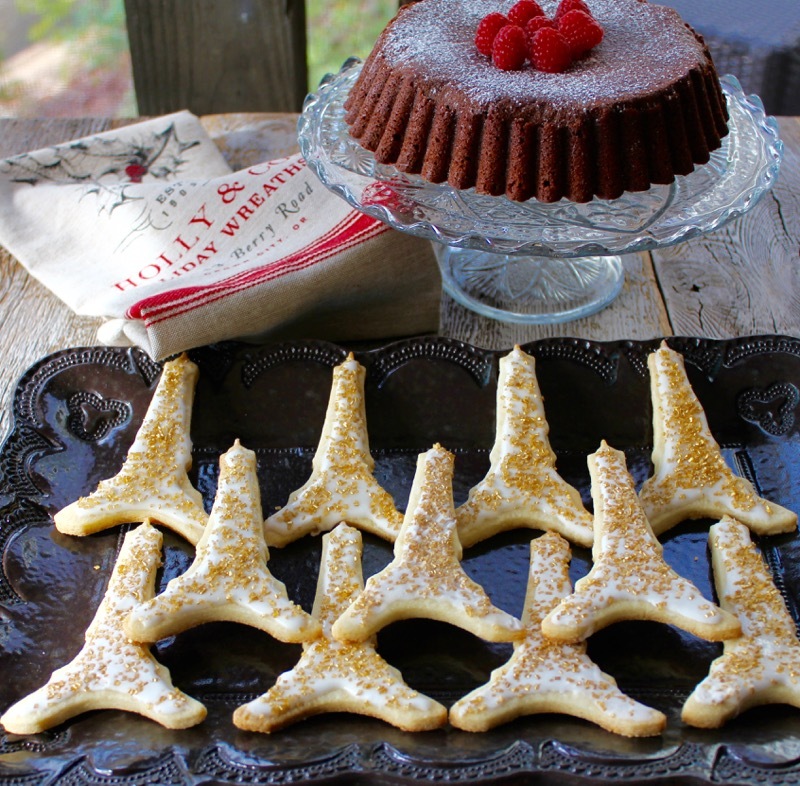 I bought my eiffel tower cookie cutter on line. All of these treats will remain in the freezer until Christmas. It feels good to have a stash of goodies ready to go for family and friends. Preheat the oven to 325 degrees F. Grease a 9-inch cake pan with butter and line the bottom with a round of parchment paper. Pour an inch or two of water into a medium saucepan and bring to a simmer. Combine the butter and chocolate in a heatproof bowl and set on top of the pan of simmering water. Stir until the butter and chocolate are melted. Remove from the heat and let cool for 10 minutes. 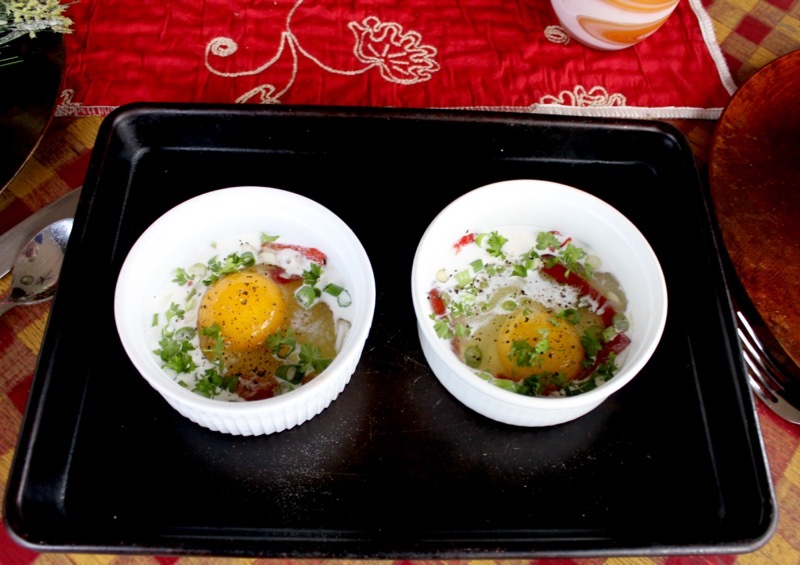 In a medium bowl, whisk together the eggs and sugar until light and fluffy. In another bowl, sift the flour and add the fleur de sel. Stir the melted chocolate mixture into the egg mixture. Add the vanilla. Fold in the flour until just combined. Pour the batter into the prepared cake pan and bake for about 30 minutes. Let cool in the pan for at least 1 hour before unmolding. 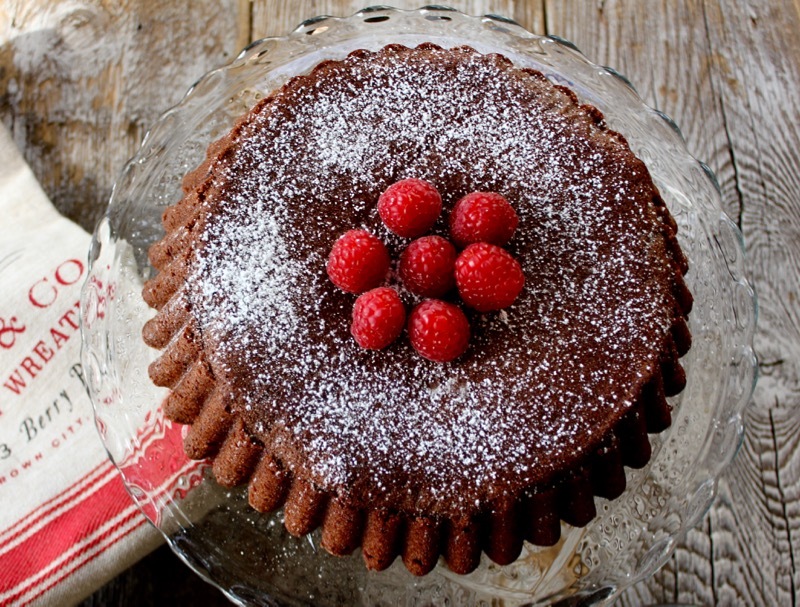 Serve topped with berries, if desired, and a sprinkling of confectioners’ sugar. Posted on December 12, 2016 at 4:02 pm.